You want to build stronger relationships and increase revenue with less hassle. Visa is one of the most trusted and recognized brands in the world. Combine your brand and Visa's household name to drive retention, revenue and build better relationships. How can you use Visa Reward Cards to your advantage? Host Facebook Giveaways and Contests like "Guess the Score" to drive social engagement and customer interactions. 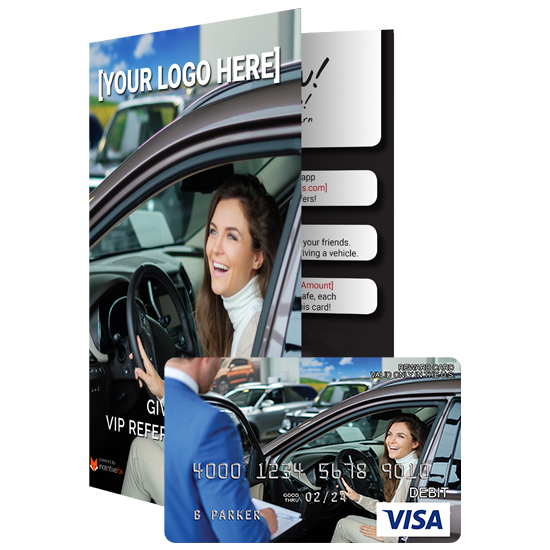 Use your reward cards for goodwill incidents at your dealership. As point-of-sale closing tactics and offers. Increase test drives with an enticing offer that can be used anywhere VISA is accepted within the U.S.
Did you know Bank of America estimates that a business check can cost an aggregate of $4 to $20, based on the price of the check and shipping, plus the time employees spend writing, mailing, collecting and reconciling the check. Create an unparalleled branding opportunity and piece that fits your brand and company. Cards come in a unique sized envelope with your company name on them that help them stand out in the mail. Incentivefox handles the complete fulfillment of your reward cards, they are sent first class to your customer. Your customer has access to their transactions and card services everyday of the year. Don't make your customer wait for another check or gift card in the mail with prepaid cards, you can reload funds right onto the card in their wallet. Card reloads occur within 24 and 48 hours of your reward submission. Interested in service rewards, employee spiffs, contests, referrals, customer engagement, test drives or direct mail and want to track them all? We've got you covered. Click here to learn more about all our available programs. What are you rewarding for most? Which loyalty solutions are increasing customer retention and your revenue. Your customers will receive automatic update emails about their reward card status.